Please take a look at this book!! :) It might help. I recently read a book that helped put a stop to my urges, because it put me in touch with everything I owned. Things that had gone long forgotten. The book has you go through a big clean and reorganizing process (that can perhaps be a safer use of manic energy?) and has you hold each item ask ask yourself if it sparks joy in your life. The goal is to get rid of or donate or sell anything that doesn’t and only surround yourself with things that bring you joy. It helps you realize just how much stuff you already have and it can be overwhelming and then eye-opening when you realize how little of it you actually need. I find myself being FAR more selective when it comes to accumulating more things since starting to go through this process and employing this simple philosophy. For me, it was when I read "The life changing magic of tidying up" by Marie Kondo (Amazon link ). Which I found out about from some reddit post about the best way to fold a shirt or something. Anyway, I realized that a lot of possessions didn't equate to happiness, and then used that as a litmus test when purchasing things. e.g. "Do I really want this? Will it make me happier? Will it just be momentary? What else could I do with that money?" Sometimes the answer is yes, but I spend much longer thinking about buying something rather than impulse buying now, because otherwise I'll be holding yet another item in 6 months time going "nah, this doesn't bring me any happiness" and throwing it out. Honestly? Throw away about half what you own... I know it sounds crazy but, it's amazing how little work it takes to clean your house when its not full of....stuff. I went through and purged... yes purged our house last year And honestly it was like taking the biggest xanax ever created. The book ill link is what got me started, the author is Japanese so there's some odd cultural things that i refrain from(I have not said thank you to my socks) but the meat of the book is great. 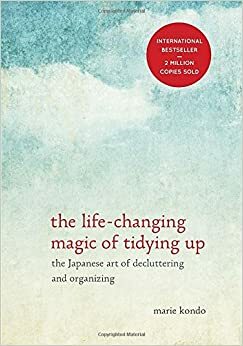 Cant recommended lt highly enough The life changing magic of tidying up. For OP: There's this book the Life-Changing Magic of Tidying Up by Marie Kondo. It basically tells the reader to purge. The method is what helped me, though. She writes that you should categorize your stuff in such a way that you purge things with low sentimental value first ending with things like pictures, handmedowns, etc. The thought process here is that you purge old clothes, unused appliances, movies, etc first so that you get in the groove of getting rid of stuff. By time you get to old pictures and memories, you have a general idea of how things go and don't dwell on stuff that you might look at two years from now. I think the book was worth a read. I read it between moves and it helped me get rid of a ton of my crap. It also helped the way I fold my laundry which saved a lot of space too. TBH, I only read about the first half up to the purging section, then skimmed the rest. It got a little repetitive by then and I already had the gist of the book. Will the scraps spark joy? Everyone is different, but it feels like a weight is lifted off my shoulders when I get rid of stuff I don't need or can't justify keeping. Marie Kondo wrote a book on this: The Japanese Art of Decluttering. I have heard this book is amazing: https://toptalkedbooks.com/amzn/1607747308 It would be a good starting place, then I would say divide things up so no one is doing a chore they hate. For example I hate cleaning toilets, but my SO doesn’t mind it. So I do the sink, mirror, and floor and he does the toilet and shower. This book is great for learning how to downsize and declutter. Minimalist philosophy is vague, so here are some books that cover a few areas. No one agrees on what the philosophy means so some will take issue with each of these I'm sure. Do it yourself guide: Clear one area (desk, countertop, bed side table) then enjoy the emptiness. That'll give you enough of a taste to explore more.